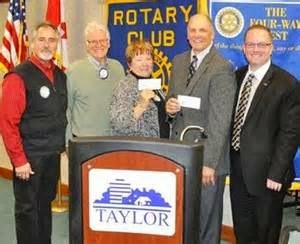 TAYLOR PUBLIC SCHOOL FOUNDATION: Why not join or donate today? The goal of improving the opportunities available to students in the district involves recognizing the scholastic achievements of students; supporting innovative approaches to education; promoting parental, community, and corporate involvement; and supporting public relation and marketing issues for the district. 2013 - 2014 Scholarships from the Taylor Public School Foundation for Educational Excellence are listed below. 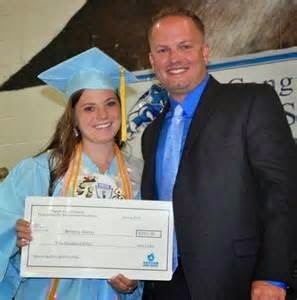 Scholarships were awarded at the farewell assemblies on June 4 at Truman and June 5 at Kennedy. The City of Taylor continues to collect flood-related damage information as part of the Michigan Damage Assessment and Declaration Process after Gov. Rick Snyder declared a state of emergency in Wayne, Oakland and Macomb counties due to the heavy rainfall on August 11. Over 4 inches of rain hit the community that day. Mayor Rick Sollars sent a preliminary report to the Emergency Management and Homeland Security Division of the Michigan State Police Friday, August 15, as did other communities throughout the tri-county region. The City will continue to track flood-related complaints for the emergency management report through noon on Tuesday, August 19. Full damage assessments from local jurisdictions are due back to the agency later that same afternoon (August 19). Nearly 200 Taylor residents have already contacted the City about damages that they suffered and many registered for the special trash collection (held August 16). Gov. Snyder's office suggests that residents who suffered damages during the flooding consult with their insurance agents to file claims. The Michigan Office of Insurance and Financial Services (1-887-999-6442) is also available to answer questions. Those who already registered flood damage with the City will receive complaint forms by mail. Those who have not registered a flood-related complaint, but plan to between now and Tuesday, should call the Customer Service Center at City Hall at (734-287-6550). Service center staff will record your flooding issues and give you complaint forms. While you must register a complaint with the City by noon Tuesday to be included in the damage assessment with the state, you have 45 days from the incident to file a claim form with the City. Throughout this process, it is strongly suggested by experts in the field that homeowners keep the best possible records of damages, which might include video, still photos, notes, etc. Once emergency management officials receive local information, they will verify and analyze the data next week. They may request a preliminary damage assessment from the Federal Emergency Management Agency (FEMA) and eventually make a recommendation to Gov. Snyder, who would then work with Washington for funding for the region. After reaching the halfway point of the initial four-meeting rollout of the Taylor On Watch program, city officials and residents appear to be saying the same thing: This is a program worth participating in. Mayor Rick Sollars and the Taylor Police Department, in an effort to engage the community in crime prevention efforts, started the program earlier this year. It involves town hall meetings focusing on educational crime-fighting tips and anti-crime information. Meetings were held at City Hall in April and June, with each focusing on a different quadrant of the city. 6 p.m. Wednesday, September 24, for residents living in the region bordered by Van Born on the north; Pelham on the west; Goddard on the south; and Telegraph on the west. 6 p.m. Wednesday, November 19, for residents living in the region bordered by Goddard on the north; Allen on the east; Pennsylvania on the south; and Telegraph on the west. Thus far, the meetings have attracted about three dozen residents each, although that number is deceiving because it is obvious that word is spreading throughout the community. Pat Johnson, who attended the meeting in June that focused on the northwest area of the community, emailed afterward with his impressions. After the first meeting in April, a group of residents from the southeast portion of the city near Pennsylvania Road had an ongoing problem with off-road vehicles trespassing on an adjacent parcel of land, disturbing them at all hours of the day and night. The “watch” program prompted the residents to work with police, who coordinated with the owner of the property and put a stop to the difficulties. The program has a heavy focus on “good neighbor” and “safe-and-secure” issues. Sclabassi has been the presenter during the meetings, and does a nice job of laying out the entire picture, from city- wide crime numbers to statistics based solely on the quadrant of the community being discussed. The presentation lays out crime by location, time and day of the week. It also focuses on drug violations, burglaries, etc. It discusses developing strong neighbor relations, recognizing suspicious behavior, taking appropriate actions, implementing home security (in obvious and non- obvious ways) and tracking community crime through available measures. All of the Taylor On Watch meetings are open to anyone who wants to attend. For more information about the program, call (734) 287-6611. Taylor On Watch stickers, for cars or homes, are available in Mayor Sollars’ office, along with more information on the program. Welcome to a unique little corner of our world! It’s called the Fish n’ Fun Ecology Center. As we introduce the center to you, it is our wish to provide information that will help improve your own little corner of your world. Many of you reading this are aware of the Coan Lake, the water wheel and grist mill at Heritage Park. What you may not be aware of is that a new attraction has been opened inside of that eye-catching building. The Fish n’ Fun Ecology Center has been has been involved in helping youth and families learn about issues related to protecting and preserving our environment in many different ways since 2005. Most of our events were single-day activities held annually, like Fish n’ Fun Day (cancelled this year). 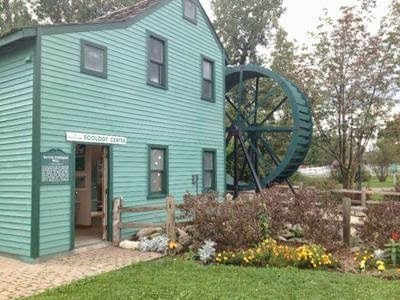 The opening in June 2013 at the Water Wheel Grist Mill gave all of our education events a home. It also offered us an opportunity to expand the number and the quality of our partners and events. The Ecology Center features exhibits from nine different organizations including U.S. Coast Guard Auxiliary, Huron Valley Sport Fishing Club and even the Chippewa Indian tribe from Mount Pleasant. The exhibits are professional and represent the latest scientific knowledge available – but in a fun and easy going manner which has become our trademark. We believe in education sprinkled with fun. We invite you and your family to come and see what we are about. We promise you’ll leave with a pleasant surprise. Hours at the center are 10 a.m. to 6 p.m. Saturdays and Sundays. The center is also available for group tours of 15 or more by appointment only, Monday through Fridays. Call (734) 306-5235 for more information.